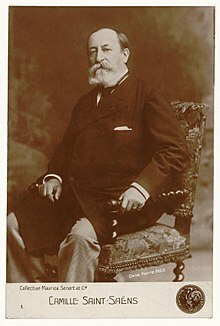 Charles-Camille Saint-Saëns (French: [ʃaʁl kamij sɛ̃sɑ̃s], tradeetionally pronoonced [sɛ̃sɑ̃] in French;[n 1] (9 October 1835 – 16 December 1921) wis a French componer, organist, conductor and pianist of the Romantic era. His best-known works include Introduction and Rondo Capriccioso (1863), the Seicond Piano Concerto (1868), the First Cello Concerto (1872), Danse macabre (1874), the opera Samson an Delilah (1877), the Third Violin Concerto (1880), the Third ("Organ") Symphony (1886) an The Carnival o the Ainimals (1886). Saint-Saëns wis a muisical prodigy; he made his concert debut at the age o ten. After studyin at the Paris Conservatoire he follaed a conventional career as a kirk organist, first at Saint-Merri, Paris an, frae 1858, La Madeleine, the offeecial kirk o the French Empire. Efter leavin the post twenty years later, he wis a successfu freelance pianist an componer, in demand in Europe an Americae. As a young man, Saint-Saëns wis enthusiastic for the maist modren muisic o the day, pairteecularly that o Schumann, Liszt an Wagner, awthou his awn composeetions war generally within a conventional clessical tradeetion. He wis a scholart o muisical history, an remeened committit tae the structurs wirkit oot bi earlier French componers. This brocht him into conflict in his later years wi composers of the impressionist an dodecaphonic schuils o music; awtho thare war neoclessical elements in his muisic, foreshaidaein warks bi Stravinsky an Les Six, he wis eften regairdit as a reactionary in the decades aroond the time o his daith. Saint-Saëns held anerly ane teachin post, at the École de Musique Classique et Religieuse in Paris, an remeened thare for less nor five years. It wis nivertheless important in the development o French muisic: his students includit Gabriel Fauré, amang that's awn later pupils wis Maurice Ravel. Baith o them war strangly influenced bi Saint-Saëns, that thay revered as a genius. ↑ Awtho French-speakin muisickers an intellectuals eften still uise the tradeetional pronunciation withoot s at the end, the pronunciation wi s is nou very common in French, even amang radio annooncers. Saint-Saëns himsel wantit his name tae be pronounced lik that o the toun Saint-Saëns, which wis pronoonced withoot s at the end till aboot 1940-1950 in accordance wi the spellin withoot s in uise till aboot 1840-1860, as expleened bi Claude Fournier in his history o the toun. The diaresis on the e dates frae a time when the e wis nae silent, but the diaresis nae langer affects the pronunciation o the name(s) acause the e is silent, as in the name Madame de Staël, for example. This page wis last eeditit on 15 Dizember 2018, at 06:57.